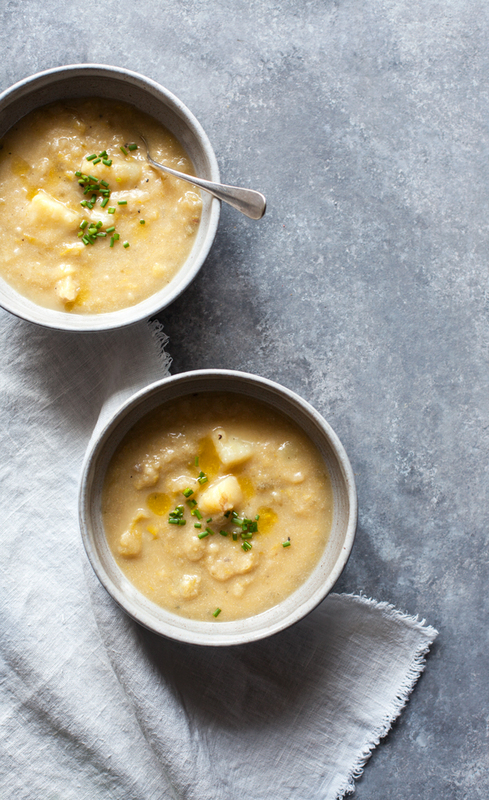 When I decided to make this creamy vegan potato leek soup last Friday, it still felt like winter here in New York. It was gusty, bitter cold, and damp, and a pot of hearty, stick-to-your-ribs soup was just what the doctor ordered. Now, half a week later, it’s practically spring outside, but I have to admit that the soup feels every bit as welcome. This is simple vegan comfort food at its finest. 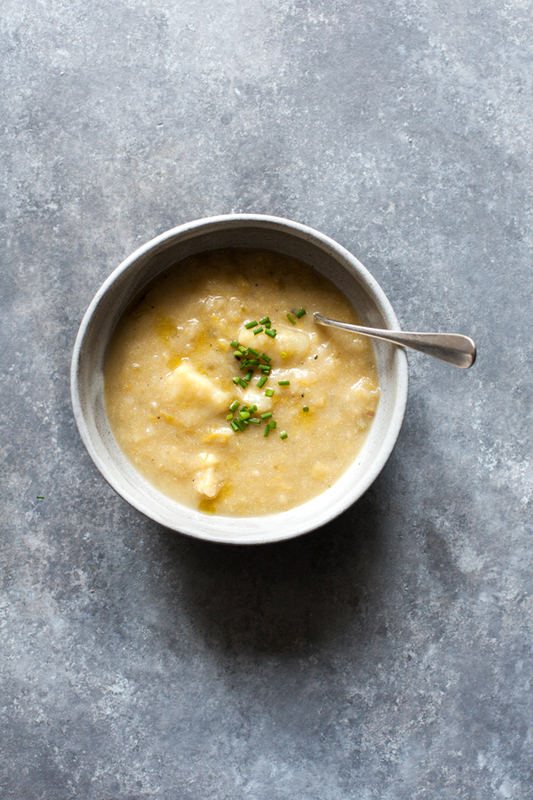 The potato leek soup is one of the recipes I prepared for my week experiencing the SNAP food challenge. I wasn’t sure if leeks would fit into the budget, but at $3.23 for a pound, they did — along with 2 pounds of yellow potatoes for about $3. 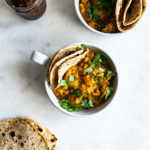 The recipe yields six generous portions (about $1.65 per serving), and the fact that it’s so warming and filling makes it a great recipe to stretch for a few days. We enjoyed it on Sunday night for dinner with some toast, and Steven has brought it to campus for lunch two days in a row. 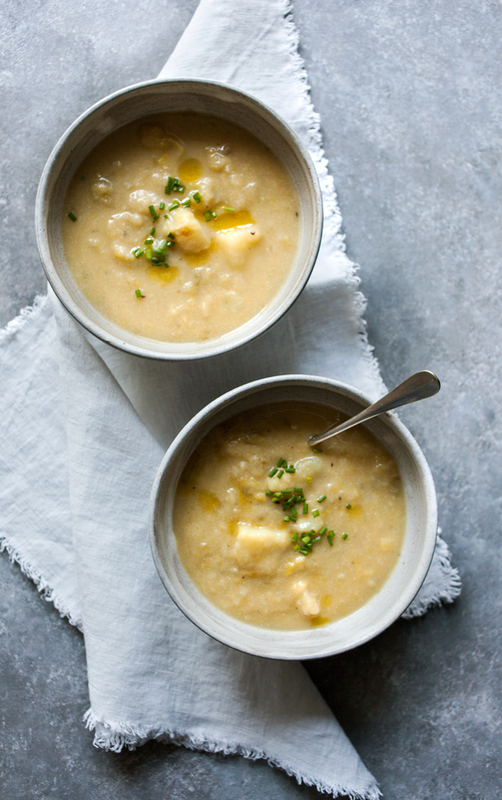 In spite of the name, this creamy vegan potato leek soup contains not a drop of cream, cashew cream, coconut milk, soy milk, or any other dairy substitutes. 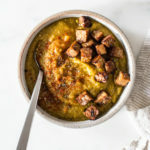 The creaminess is all thanks to the potatoes, which get half-pureed with an immersion blender (or regular blender), as well as the nutritional yeast, which adds umami to the soup. One of the things I love about this recipe is that it’s so ridiculously simple: cleaning and chopping up the leeks is probably the most time-consuming/annoying step. I jump at a chance to cook something with so few ingredients these days, but you could definitely choose to add some additional vegetables or seasonings (like additional fresh herbs) if you’d like to jazz it up. Coconut bacon would be a killer topping. Heat the olive oil in a large soup pot over medium heat. Add the leeks and celery and cook, stirring occasionally, until the leeks have completely cooked down. Add the potatoes, salt, and pepper. Add the broth and water. Bring to a boil and lower to a simmer. Simmer for 25-30 minutes, or until the potatoes are so tender that they’re almost falling apart. Use an immersion blender or a regular blender to blend about half the soup, so that it has a creamy, thick texture but chunks of potato and celery are still visible. Stir in the nutritional yeast and adjust salt and pepper to taste. If you'd like to add greens, stir them in now and keep simmering the soup until they're wilted and tender. Serve the soup with toppings of choice. Leftovers will keep in an airtight container for up to 6 days, and can be frozen for a month. While the soup is perfect with a crusty slice of bread or toast, it’s definitely filling enough to stand on its own. Stirring in the optional greens helps to add more fiber and a little extra nutrient density. Steven doesn’t care for greens in his soup (it’s a texture thing), but I do, for the opposite reason (I love the texture), so when we made it I set is portion aside and stirred some chopped spinach into my bowl. The meal was quick, easy, and really satisfying. 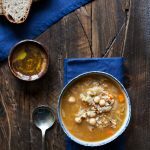 Whether you’re still immersed in winter temperatures or just now climbing into spring, this soup is a wonderful go-to recipe for quick comfort food. I hope that it’ll be warming you up soon. I have made a similar soup using Cannellini beans instead of potatoes. Will have to try this. Made this soup for guests after a long day of skiing with trepidation’s as it was my first attempt. Beyond the wow effect from three grown men, not speaking just mumbling in Cornwall talk, delicious. Was served with homemade bread and ended up the highlight of their meals during the week of skiing. My extra ingredient, grated Parmesan cheese. Making more now for future guests. Love this soup and recipe! P.S. I am afraid of cooking and testing out the taste of the food I am preparing. This was really good! This soup looks absolutely delicious, Gena! And I love that you did it as part of the SNAP challenge. This soup is beautiful! I love that you just used potatoes for the cream factor. I’ve always heard of the SNAP challenge and I’d be very interested to participate! I think it’s great to put things in perspective. I am so intrigued by this assignment you are doing and how you are making it work financially. It’s impressive (and inspiring!). I am curious…do you and your partner normally buy organic produce, and if so, have you had to choose conventional produce for this challenge in order to stay within budget? I can’t get over how creamy this soup looks! And the color is beautiful! I can only imagine how delicious this soup is! Ohh yea, soups are the best for cold days! I just clicked over to your coconut bacon recipe, and oh man, I reallllly need to try it when I get home! I’ve never really tried flavoring coconut before, so this will be a fun experiment! This was super delicious, Gena! It’s definitely going into the rotation of favorites! Thank you! Sorry to be so out-of-touch lately. But this recipe looks incredible! Hope you are doing well! Cheers from Buenos Aires! I made this and loved it! Trying to stay away from dairy and enjoy the flavor of nutritional yeast. I did not have any celery so just added a diced small onion and it was perfect. Hi Gena! I love your work! I made this soup last night in my pressure cooker. It was perfection. Thanks so much for sharing. Thanks for this recipe base! 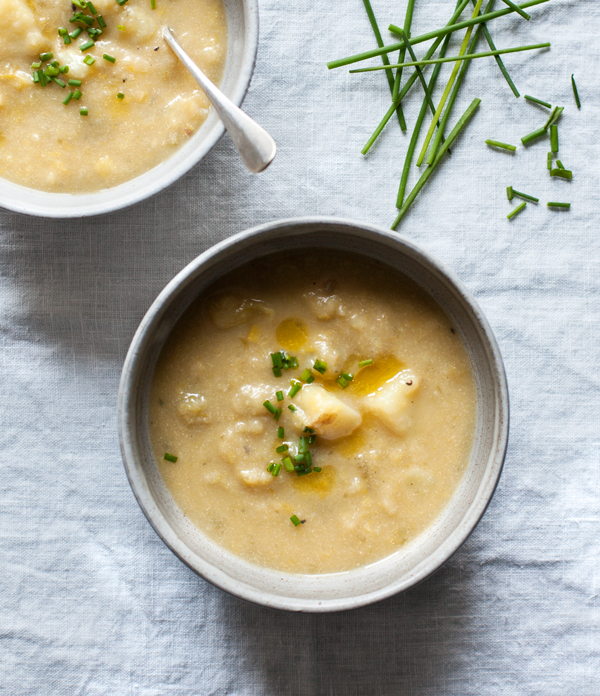 I just made a big pan full of this creamy Potato and Leek soup with a couple of changes.. I swapped two green Kale leaves in for the celery and sautéed them with the leeks rather than using oil. I used mostly white potatoes and used a sweet potato to bring it up to 2lbs. Everything else I did the same. Readers might like to taste it before you add in the nutritional yeast which gives the soup a slightly cheesy flavour. My poorly wife really appreciated it! Just made this into a Massaman curry saice by adding 2tbsp of Wholearth peanut butter and 3/4tsp of paprika. Gorgeous! Just made this tonight, it’s fabulous! I sauted a chili with the celery and leeks, and added some spinach. I loved the Brewer’s yeast. The chili gave it a little kick. I also grow them and need to use them up. Would love to do this in my instant pot, do you know how I could adjust to do so? I don’t have an Instant Pot and haven’t worked with one before, so I’m afraid I’m not sure how to tell you to adjust it–and I wouldn’t want to steer you in the wrong direction. If I become savvy with the Instant Pot in the future, I’ll be sure to update with an option! How important is the nutritional yeast? It always seems to give me a gut ache…can I skip ir substitute with something else? Just made this soup. Yum! I tried a different vegan potato leek soup recipe last week, and the texture was glue-like. Not this. Perfect texture AND taste. Thank you for sharing the recipe! I made it tonight for supper and it was delicious. Had 2 big bowls. This one is going on my favourites list. This was so delicious! Didn’t have celery but added fresh parsley in at the end. This was absolutely delicious! My partner made it but added some garlic and white beans to the mix, as well as the suggested kale at the end. 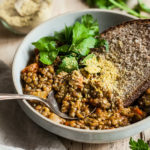 Such a delicious yet simple dish, nutritious and filling, it is definitely going on our winter staples list! The added nooch was a winning touch. I am so glad you enjoyed it, Misha! I made this soup last night for my family…everyone LOVED it! Even the four year old! Delicious and so easy! Thanks so much! I made this for dinner tonight, it was amazing! Will definitely be making it again. Just made this last night….it was so delicious that it surprised me. I did add 2 garlic cloves and 1 tsp of the nutritional yeast. It is a definite keeper and was so easy and fast to make. Definite comfort food. It did end up more like mashed potatoes and not so much soup but that was fine. Amazing! I was nervous about the nutritional yeast but the soup was so yummy!!! This is the BEST potato soup recipe I’ve ever used, and so simple!! I make it all the time now. So glad to hear that, Merry! I made this soup tonight for my boyfriend and I, and let me just say… it was extremely delicious. If you’re looking for a healthy and comforting soup to make on a cold evening in December, look no further. Wonderful recipe! I had some parsnips, so I peeled and chopped them and added them in with the potatoes. It added some really nice flavor. I really loved this soup! I didn’t have kale or spinach to add. However, I added some dried dill weed and it was tasty. Then I had the idea to add some finely diced dill pickles. WOW. I loved it! Turns out there’s a Polish soup called “pickle soup.” It is potato-based but has many non-vegan ingredients. This soup with the added pickles mimics the Polish soup that maybe I had as a child (my family lived in Poland for a short time). Anyhow, thought I’d share. I love this tip, Vee! My daughter made this for me tonight and it was delicious! She used a ton of spinach, so it turned out very green and beautiful! This soup is delicious and easy! I added a tsp of herbs de Provence, a few cloves of garlic, and a can of cannellini beans for a protein kick. Added a few tbs fresh parsley in the end. Will definitely make again! Love the flavor the nooch gives. I would definitely make this again! The recipe is very simple and easy to follow. This soup is not frilly or over-the-top (taste-wise) but I find it to be very comforting and hearty. I added a few turns of fresh-cracked pepper on top, in addition to green onions, and it is perfectly savory. Thanks! Very glad you enjoyed it!